Technically, monochromes mean single color. Back then, artists used different shades of one color to create monochromatic artworks. They diluted black/brown ink to get lighter or darker tones of the same color. Well, the question arises if you can create an excellent artwork with just one color. HOW DO YOU PAINT IN ONE COLOR? Brown and black are not the same colors. However, grey and black are. Diluting black or adding white to it will produce grey. In fact, adding more white will get you a lighter shade of grey. These are values of the same color. Similarly, grey can be shaded by adding black. In this way, you can mix up a gradient of different color variations. Remember, it is difficult to re-mix the same colors. Hence, better save the colors if you are not planning to finish the painting in one sitting. Preserve your paintings in separate plastic cases. There are a lot of technicalities depending on what you are painting. You could paint a live model or landscape depending on your skills. Also, many beginners use reference images. The overall result will be in one single color. WHY DO ARTISTS USE ONLY ONE COLOR? Monochromatic paintings reduce art into its simplest form. Grisaille is a technique of executing an entire painting in different shades of grey. Here ‘Gris’ is a French word meaning grey. In earlier days, abstract art drove all the artistic minds to a whole new level. A group of French artists called the ‘Incoherents’(19th century) produced the first monochromes. However, Kasimir Malevich’s ‘White Square on White field’ (1918) stood out. In fact, art history considers it to be to the first monochrome. He expressed the absoluteness of painting. Also, it moved us towards an infinite and dynamic space by freeing our minds of any material considerations. Several artists brought up new ideas by following the monochromatic path. Moreover, by using one the color, the artists discovered the tranquillity of total abstraction. Monochromatic paintings help beginners focus on an art as a whole. This, in turn, helps them avoid glaring issues. Also, the role of light and dark enables an artist to define form and create a piece. Color plays a different story. However, the profound impact of wholeness can only be achieved by black and white. WANT TO PURSUE A CAREER IN FINE ARTS? Kala Bhavana ( Institute of Fine Arts), Visva Bharati, Shantiniketan offers all major streams of art. Pencil and Chai, by Coloring India Foundation, Bangalore conducts sketching classes on Sundays. 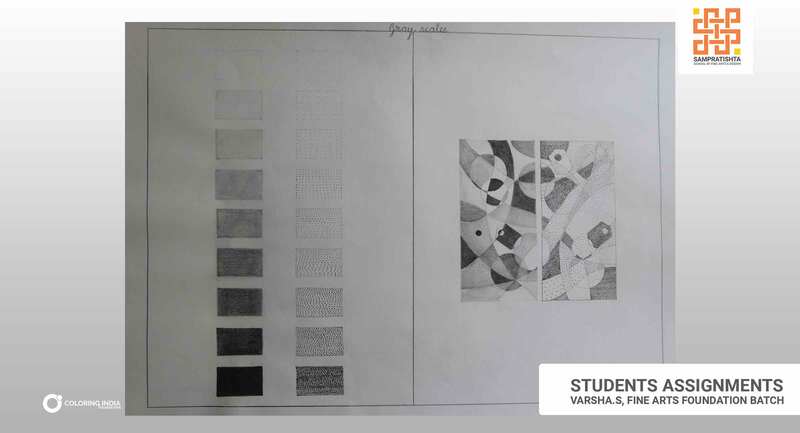 Faculty of Visual Arts (BHU), Banaras offers Undergraduate (UG) and Postgraduate (PG) degrees in painting, applied arts, plastic arts, textile designing, pottery and ceramics.